The adventure starts before you even arrive in Flåm, Norway. Whether you take the famous Flåm Railway or you arrive by car, the scenery you’ll encounter on the way will be overwhelming in its natural beauty. Winding through snow-capped mountains, rolling pastures, lush forest, profusions of wildflowers and dramatic fjord, the journey will take your breath away. Stay at a hostel in Flåm and as you’d expect, the wild landscape will offer you an array of outdoor activities as well as the opportunity to relax in a harmonious landscape alongside the world’s second largest fjord. Spend some time kayaking in the pristine blue water, cycling down the mountains, and hiking past waterfalls and abandoned farmhouse buildings. For incredible views of the fjord, take a guided hike up to Stegastein Viewpoint. Or for a relaxing ride up, take a bus to Stalheim Viewpoint and admire the valley and town below. Welcome to a journey on the Flåm Railway - one of the most beautiful railway lines in the world. Discover the Flåm Railway - an incredible train journey from the mountain station at Myrdal on the Bergen Railway, down to Flåm station, nestled in the innermost corner of the Aurlandfjord. 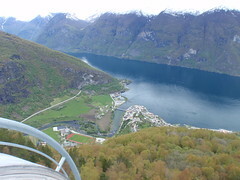 Stegastein is an award-winning viewpoint by the Aurlandsvegen road above the Aurlandsfjord, Sogn og Fjordane. On a walkway of solid pine reaching 31m into the air, you’ll see fantastic views across Aurland and the Aurlandsfjord from a 640m vantage-point. Read this great blog and learn more about Flåm from a traveller's perspective. Flåm Port is one of Norway’s most popular ports of call for cruise ships, with over 130 ships putting in every summer. 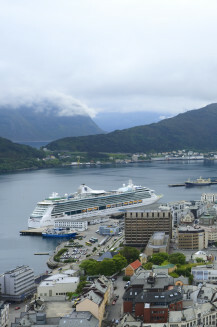 In May 1999 Flåm have improved the berthing facilities to enable the largest cruise ship to berth alongside.